Radiology uses X-rays, radioactive tracers and ultrasonic waves to help physicians detect, diagnose and treat a number of diseases and injuries. Continuing developments in technology, computers and science have advanced our ability to noninvasively view the body's inner structures, tissues and organs. The dynamic images provided by radiology are essential to physicians because of their realistic depiction of the anatomy, functions and abnormalities within a patient's body. Ultrasound uses sound waves to develop images of inside a patient's body. Diagnostic X-ray uses low doses of radiation to produce images of the body. Fluoroscopy uses X-ray technology to produce a continuous moving image. Nuclear medicine uses radioactive material to help diagnose and treat a wide range of medical conditions. 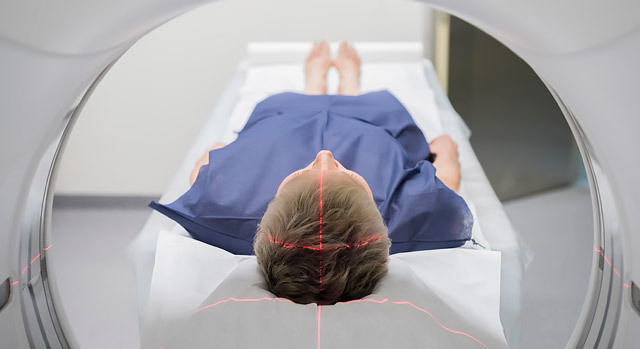 Magnetic resonance imaging (MRI) uses a magnetic field, radio frequency pulses and a computer to obtain detailed images of the inside of a patient's body. Computed tomography (CT scan) uses specialized X-ray equipment and computers to obtain detailed images of the inside of the body. Each image created by CT scans shows a thin slice of an organ or body part. Computed tomography angiography (CTA) combines CT scanning technology with an iodine-rich contrast material injected into the patient's bloodstream to help identify and locate blood vessel disease or related conditions. MR/CT arthroscopy uses MRI and CT to obtain images of a patient's joints. Digital radiology is a form of X-ray in which digital sensors are used instead of traditional photographic film to capture images. 3D mammography/tomosynthesis can provide more detailed imaging than traditional mammography. Interventional radiology allows surgeons to use imaging guided, minimally invasive surgical techniques to diagnose and treat diseases. Bone densitometry measures the density of a patient's bones. CT biopsy uses CT technology to guide a surgeon as the surgeon uses a thin needle to withdraw a tissue sample from a suspected tumor mass. Ultrasound-guided and MRI-guided breast biopsies use either ultrasound or MRI technology to help surgeons locate an abnormal area of the breast for biopsy. Preoperative needle localization is a technique in which a tiny guide wire is inserted into the breast to help surgeons locate an abnormality that can be seen on a mammogram but not felt. Sentinel lymph node mapping is a procedure that helps physicians learn if a patient's breast cancer has spread beyond the original tumor and into the lymph nodes. SIR-Spheres therapy uses radioactive microspheres that are implanted inside a cancerous organ to help destroy cancer cells. To make an appointment, please call 941-745-7391. The Breast Health Center provides comprehensive diagnostic care.